We’ve just spent some weeks working with our team developing our new website (yes, hoorah we’re excited about it – have a look at Franchise Simplyand tell us what you think at info@howtofranchisesimply.com.au) and after lots of research here’s what we’d like to share with you. Does your Homepage or headline clearly state the number 1 problem that your prospect is facing right now? And do you offer a solution to that problem? In these days of high-speed media offering a huge choice of anything we are looking for… whether it be a service a product or information, we have all become fairly impatient when looking for a solution. The plain fact is that no one reads all the copy. Just think about flicking through a magazine in the doctor’s surgery or when sitting in an aircraft. It takes something to catch your eye for you to give it your attention and read the story. In the world of exhibitions, this very brief opportunity to grab someone’s attention has been acknowledged for decades. If you’re walking past a stand you’ve two seconds to grab someone’s attention and a further 10 seconds for them to scan and absorb your message before they walk on to the next booth.That’s exactly the story online and why a wonderful story of your history with lots of copy and your name blazed across the headline serves nothing more (and you might not like this home truth) than to build your ego. It’s really very simple — if you’ve got a headache you want a Panadol and you don’t have the patience or indeed the interest to read the details of all the contents etc. etc. All you want is to fix the problem. Just think of the product you offer in the same light — whether it’s clearing up acne, cleaning a dirty house or repairing broken tap washer. And – this is critical – it all needs to be above the fold – in other words on the opening screen without the need to scroll down. If your headline and the subsequent solution you offer does the job, then your visitor will want to look further but otherwise it’s likely they’ll be off to the next competitor and you’ll have lost them for good. Do you have a compelling Free Gift or Report in exchange for their contact details? It has to be enticing, relevant and visible near the top of your Homepage. So, you’ve attracted them with your headline, they can see you have the solution to their problem but who makes a commitment to buy there and then? Not many people — just like visiting the shopping centre to buy a new outfit. After you visit a few stores and probably, in some of them, try something on, you’ll wait awhile before making a decision. It may be after a thoughtful cup of coffee or even the next day or weekend you make your purchase. Online is exactly the same. Except you probably won’t remember all the sites you’ve been to and how do you feel about their credibility? This is the point at which you need to be collecting your list or database of visitors so you can get back to them or follow them up in traditional terms to remind them of how good you are. And they are not going to give you their e-mail address unless you can give them something compelling in exchange. This is where your free gift or report comes in. If you are looking to move house and removals company offered you a free booklet “Discover the Removal Industry’s’ Top 6 “Insider MOVING TIPS” there’s a fair chance you’ll take a copy to make sure you avoid making any avoidable mistakes when you move house. One which quickly cuts to the chase and highlights to your prospects the undeniable benefits of dealing with you? Not an Aunty Beryl “Thanks for visiting” style welcome video where you bore them to tears! But rather a punchy, straight-to-the-point, “benefits proven” video. This is the age of the lazy reader and if you can present a brief and snappy credible video you are going to double the impact that your problem and solution driven headlines offered. With all due respect this may not be a part for you to play. Whilst your content is not pitching for a Grammy award, your website visitors need to find it compelling to watch in terms of the presenter and the script. Be brutally honest here, because you, like many people may not come across well on film — you may appear nervous or hesitant or uncertain of your script. And this is normal — so you may need to make a small investment by using an actor or someone in your organisation who can talk clearly and with energy and enthusiasm. And the script for this video is just as critical as your landing page – state their problem, your solution and a brief a compelling reason why they should choose you. And it’s important not to get carried away with your life history. Just give the benefits in 1 to 3 minutes maximum. Your viewer will not have the patience to watch a 10 minute episode. Do you have video testimonials from raving fans? In other words, do you have clients backing up your claims and telling everyone how marvelous your products and services are? We are human beings and suspicious by nature, especially if we are looking at something or someone new to us. If you haven’t been referred by a friend or colleague — which is the most powerful business inquiry you can get — then without doubt, the next best thing is a bunch of credible testimonials from your satisfied clients. Whilst you’re looking for something natural and credible from your clients, it’s sensible to give them a brief. Get them to start with their original problem, mention that they looked around in the marketplace, say why they chose you, how you fixed their problem and how great it was to deal with you, followed by a strong recommendation to any viewer to just speak to you before they make a decision. Whilst using testimonials in written form can be helpful, it’s critical that you have a number on video, easily accessible on your site — not hidden away under a separate tab. Whilst it’s good to have a testimonials page with numerous case studies, you also need to have one or two very visible on your site — on the right hand side or above or below relevant content. A simple but well tried and tested formula which has been developed from traditional and proven marketing methods and now applied successfully online. If you’ve got the product to solves someone’s problem and you can clearly illustrate that to them and substantiate why they should choose you, then you have a website that works. And here we have to face the painful truth. Developing your website to comply with this formula is something you and your staff are not capable of doing. In fact, nor are a vast number of so-called Web marketing and development companies who promote themselves as experts. This is a field littered with lots of ordinary performers who can put a WordPress site together and copy someone else’s mundane content. This just won’t cut the mustard in online business today so you need to budget for realistic advertising costs. This is no different to the budgeting you used to do when advertising in newspapers and magazines. After all this is the new shop front of your business. The key to our new marketing strategy is our 4 minute Questionnaire? 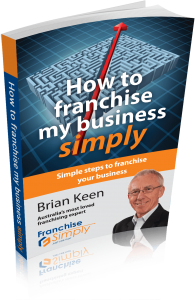 “Is Your Business Franchisable?” If that’s a question you want answered then why not go and do the test – I’d love to get your feedback brian@howtofranchisesimply.com.au or call 1300 960 136.